The low cost, low resistance SafeTway® mouthpiece allows entry of expired air into the measuring system, but not back to the test subject. This simple, yet effective patented design prevents concerns of accidental inhalation of pathogens. 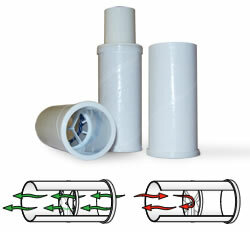 The SafeTway is an inexpensive alternative to the bacterial viral filter for expiratory only testing. It fits most pulmonary function test equipment, including peak flow meters. An adaptor may be required. The Mini SafeTway with a 22mm diameter mouthpiece is also available for paediatric use or for elderly test subjects who have difficulty fitting their mouth properly around the standard mouthpiece size.